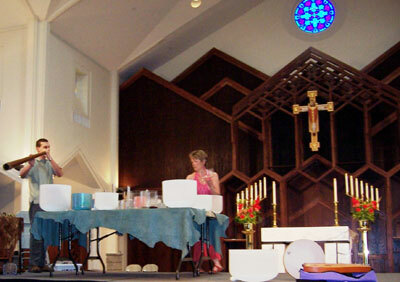 Frosted and Clear Singing Crystal Bowls are a byproduct of the semi-conductor industry and are mass produced worldwide. The wall of each bowl is calibrated to an exact thickness for industry standards. Although singing crystal bowls are not produced to create specific notes, every bowl has a specific frequency and tone. Overtime these beautiful bowls became available to the general public for vibrational healing, meditation, chanting, toning and musical accompaniment. 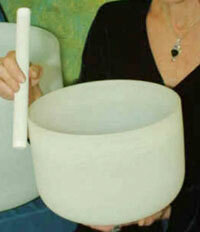 In 1995 the first hand-held crystal bowl was created specifically for sound healing. 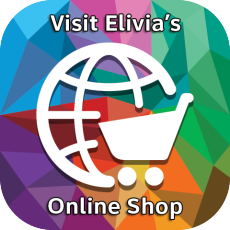 In 2000 crystal bowls began to be created which were fused with gemstones and precious metals. This fusing process was already a part of what the semi conductor industry was doing with the crystals they were growing. Then a new type of bowl was created by adding colorants to produce clear color chakra sets. As time goes by we hope to see many new styles and kinds of singing crystal bowls, created specifically for sound healing. Read about crystal bowls and vibrational sound healing on this page. Learn how quartz crystal sound works. 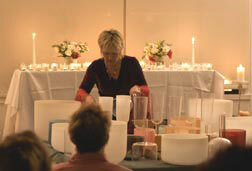 Discover the healing mechanics behind the quartz crystal singing bowls. 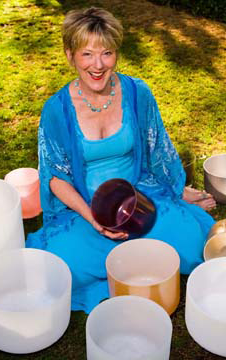 Understand how singing crystal bowls tones enhance the healing dynamics of all vibrational healing practices. 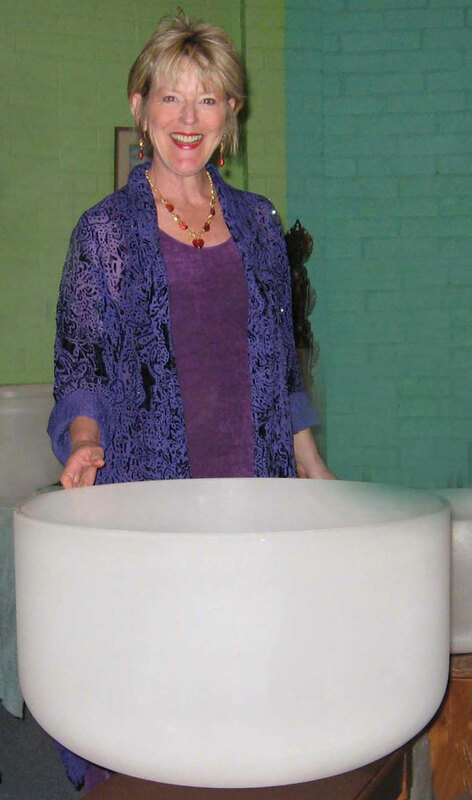 The notes of the crystal bowls are tuned to specific vibrational frequencies (notes) found within the human body. Thus when the sound moves through the atmosphere and touches us, it causes our cells to move in different directions at a different speed, in rhythm with the sound wave. This puts us in harmony with the sound wave. The sound penetrates into our very cells and rebalances them through oscillation and resonance. Hearing is not a prerequisite for benefiting from these healing properties. Studies have shown that sound has a direct impact on the mental processes, muscles, nervous system, (heartbeat, pulse) digestive system and circulatory system. Alignment with the tones of the Singing Crystal Bowls is one of the most dynamic forms of sound healing found today. Animal behaviorist have found that dogs, cats, birds, and reptiles all respond well, with their physical and emotional issues dramatically improving through listening to the sounds of quartz crystal singing bowls. 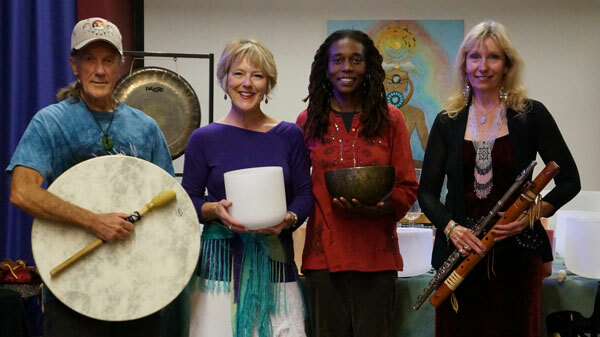 Dr. Mitchell Gaynor, author and director of Medical Oncology and Integrative Medicine at the Cornell Cancer Prevention Center in NY has been using sound, including Tibetan Bowls, Crystal bowls and chanting in work with cancer patients for many years. “If we accept that sound is vibration and we know that vibration touches every part of our physical being, then we understand that sound is heard not only through our ears but through every cell in our bodies. One reason sound heals on a physical level is because it so deeply touches and transforms us on the emotional and spiritual planes. 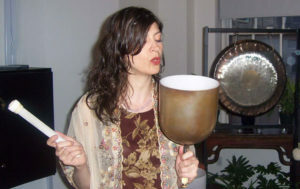 Sound can redress imbalances on every level of physiologic functioning and can play a positive role in the treatment of virtually any medical disorder.” According to an article in Spirituality and Health magazine, his research shows that the sound vibration of the bowls affects the disrhythmic motion found in cancer cells and cause a harmonious transformation. Famous sound pioneer, French surgeon Dr. Alfred Tomatis found that melody lines with the absence of tempo and emphasis on long, slow breaths provided a “fantastic energy food” for the entire human body. His work in healing all the monks in Benedictine monks in the 1960’s has now been scientifically documented by research done by Dr. David Simon, medical director of neurological services at Sharp Cabrillo Hospital in San Diego. Dr. Simon discovered that chants are chemically metabolized into ‘endogenous opiates,’ which act on the body as healing agents and internal painkillers! Music has been found to have a significant effect in bringing into harmony the following medical conditions: Attention Deficit Disorders (ADD), Attention Deficit Hyperactivity Disorders (ADHD), Learning delays, Autism, Dyslexia, Balance and Coordination Problems, Sensory integration and motor skill difficulties, Asperger’s Syndrome, Pervasive Development Disorder (PDD), and Down’s Syndrome. Singing crystal bowls came into being in the mid 1970’s. Made of quartz crystal, they are a byproduct of the computer industry and are also used to produce synthetic diamonds, rubies, and emeralds. Known as crucibles, they are produced worldwide. Originally, the industry only grew microchips at exact frequencies. 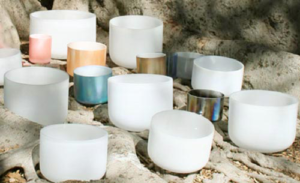 Now, these beautiful bowls are available to the general public for vibrational healing, meditation, chanting, toning and musical accompaniment. They are made of the purest silica sand, spun in a centrifugal mold and heated at extremely high temperatures. The wall of each bowl is calibrated to an exact thickness. Produced in this manner, every bowl has a specific frequency and tone. This process of quartz fusion creates a singing crystal bowl of absolute timbre. Clear bowls are made from cut sections of large diameter quartz tubing, melted and fused at one end. The tones produced by playing the surfaces of these bowls are astounding. Some of which have been found to be perceptible to human ears, at distances up to almost 2,000 feet. Crystal singing bowls along with flutes are the only two instruments capable of producing a perfect sine wave, also known as puire tone. These waves do not errode over time and contine in their perfect form much like sending a beam of laser light off into the night skies. The pure tone of this perfect wave is capable of correcting imbalances in the human body through the law of resonance. This law states that when two similar energetic systems encounter each other, their vibrations will come into a state of harmonic vibration. Our brain wave patterns in alpha state have the same energetic pattterns as sine waves. In alpha, you are in a meditative, calm state. Here your brain is alert, yet focused and receptive. In this state you are also more creative and open to learning. This is the perfect place to be for healing on all levels. 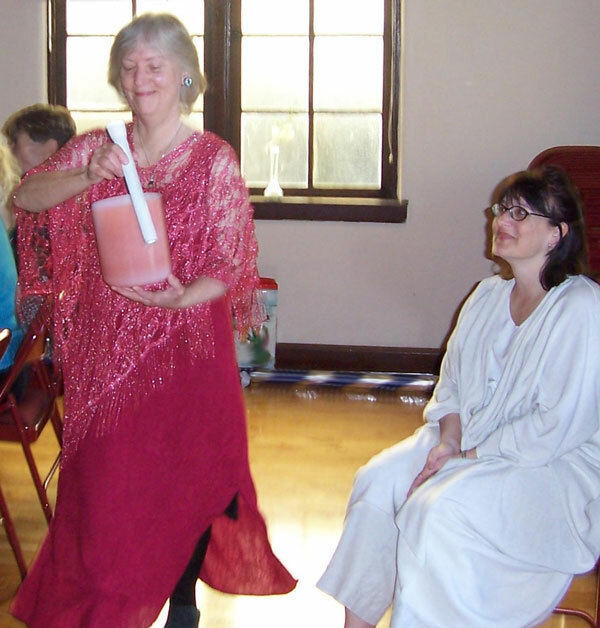 Ministers of many Interfaith traditions are now integrating the use of singing bowls into their meditation at church services, as the purecrystalline tones move parishioners into a receptive state for Spiritual healing and growth. As chakra bowls, crystal bowl therapy helps to balance the chakra system and re-energize the auric field. Healing is thus made possible on all levels. Each individual is unique as to which energy center(s) require balancing, so you may find yourself drawn to different tones each time you experience them. Body and Energy work practitioners have found that sessions with clients are dramatically more effective with the addition of crystal sound therapy. Clients immediately go into a state of full receptivity and relaxation. This allows the practitioner to go deeper and more easily reach underlying issues. 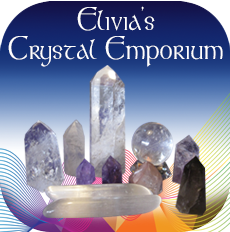 All Vibrational healing modalities are dramatically enhanced with the integrated use of crystal sound therapy. These would include the following: Acupuncture, Aromatherapy, Bach and Flower Essence, Biofeedback, Body Talk, Chiropractic, Color therapy, Crystals and laying on of stones, Geometric Repatterning, Guided Imagery, Herbs, Homeopathy, Hydrotherapy, Hypnosis and Past Life Regression, Hypnotherapy, Light therapy, Massage, Meditation, Polarity, Qi Gong, and Tai Chi, Rebirthing, Reflexology, Remote Releasement, Sacred Geometry, Shiatsu, Trager Work, Transformational Breath work, Yoga, and Touch healing practices such as Emotional Freedom Technique, Matrix Energetics, and Rapid Eye therapy, among others. Those who practice energy work such as: Laying on of hands and Spiritual healing, Reiki, Jin Shin Jyutsu, Light Body and the like will find that their session will produce deeply receptive states for all their session with their clients. Space clearing for Feng Shui is also dramatically augmented by the use of crystal sound.